It's that time of year again folks. Time for guys (and not a few girls) to don football jerseys declaring their allegiance, stock up on meat and chips, perhaps smear some of that black stuff under their eyes and then head over to the couch to obsessively play the latest game in EA's Madden franchise, Madden NFL 09. It's the 20th anniversary of their flagship sports title, and that should indicate that fans are in for something special. Has the series, often criticized for taking baby steps between installments, managed to deliver a truly special game to mark this milestone, or have they dropped the ball? Now with the post-game report, the assembled game critics of the internet. GameDaily To further assist your play style, EA added EA Rewind and EA Backtrack. Rewind allows you to erase a play in case you screw up with an interception or fumble. Cheaters are sure to squeal in delight over this addition, while devoted players will turn it off. Backtrack is more helpful, with Cris Collinsworth and Tom Hammond, the in-game announcers, breaking down certain plays to tell you what went right or wrong. GameSpot Just as there are plenty of good things to talk about with regard to 09's gameplay, there are some problems worth mentioning. Slants and crossing routes are exceedingly difficult to defend against. The linebackers who could snag almost any ball out of thin air last year were annoying, but so is watching a lousy QB and below-average tight end pick you apart like they're Peyton Manning and Dallas Clark. It's not all fun and games for QBs and receivers though. Quarterbacks will frequently overthrow passes in the flat so that they lead receivers right out of bounds or receivers will get stuck in an animation and, head to the sidelines, lose yards, or run right into a tackler. Associated Press One of the problems in a series with so much history is that it can be somewhat daunting to a newcomer. Many of the new features in "Madden 09" are geared toward helping the novice. For example, play selection can be as simple or as deep as you want it. At the easiest level, the computer will select your plays for you. Later on, you can arrange your playbook by play type (power run, quick pass) rather than by sometimes confusing formations like Z slant wide corner or double Z LB spy. 1UP A perfect example of the upgrade: Beautifully realized snow games — a quantum leap from the pseudo-sleet that passed as powder in recent years (though why do footsteps stay in the snow, while tackled players leaves no trace?). The rivalry games (Giants vs. Cowboys or Jets vs. Patriots, for example) receive a different, more epic visual treatment than regular games, which seems a tad overdone — during a Broncos vs. Chiefs clash in the rain, the jerseys were so muddied and the lighting so dramatic that it was tough to tell the sides apart. 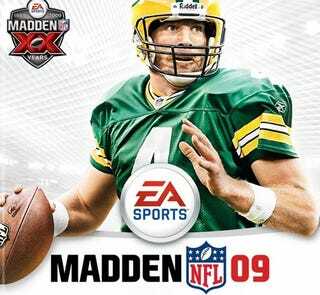 G4 X-Play With EA owning the NFL license till 2012, they could have easily milked the franchise with minor tweaks and the occasional roster update till their deal expired. Madden NFL 09 actually reinvents the series with upgrades to previous modes as well as the introduction of new ones like Madden IQ, Online Leagues, and Madden Moments. The new commentating team, Backtrack replays, soundtrack, and improved graphics really packs that extra punch of realism making this game a must buy. While I still haven't even opened my copy of Madden NFL 09, I've heard it's very nice.